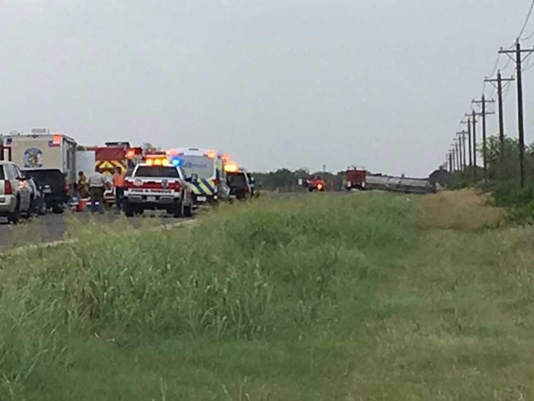 Yesterday, on 9th August, an accident west of Orange Grove on FM 624, resulted in the death of a lady driving an 18-wheeler carrying 8,800 gallons of unleaded fuel, half of which spilled on to the road. The driver, pronounced dead on the scene, was an employee of Mission Petroleum Carriers. The accident site near County Road 308 was the scene of hectic activity as Department of Public Safety troopers arrived and took charge of the situation. All present on the scene were asked to move 1,000 feet away from the accident site. The 18-wheeler was bound to Laredo from Corpus Christi; the reason for the vehicle rolling over multiple times is still to be ascertained. A Hazmat crew sprayed foam onto the leaked fuel. AirMed and JWC deputies were also present on the scene. On the 1st of August, another woman was killed when her car collided with an 18-wheeler in Humble. The woman crashed her car into the big truck that was making a left turn into Lawler’s, a dessert business in that area. The truck was headed north on South Houston Avenue.